The magazine in Australia that I mentioned before published another one of my stories. I again hope they don’t mind if I share. It’s very exciting to see one of my pieces in print, and it makes me really proud. Below you can find the full text with a graphic of what it looked like in the magazine. I’ve added a few hyper links to the pictures and videos mentioned in the story. The Dornier 228 turboprop sat eighteen passengers. It was just wide enough for a person to stand in the aisle, both arms outstretched, fingertips touching the sides of the plane. I settled into the dark blue fabric of my seat, as the stewardess picked her way over hiking boots and backpack straps, distributing hard candies that would help our eardrums adjust to the altitude during takeoff. The stewardess’s uniform mimicked a traditional Sherpani chupa—a full length red jumper tied in the back over a white silk shirt, framing her neck like the collar of a kimono. A colorfully woven rectangular apron pinned to the front of her dress completed the look. As I took my foil-wrapped candy, I wondered if it was an Agni Air policy for stewardess uniforms to include the apron, or if it truly signified that the attendant was married, as it would in Sherpa culture. The two pilots completed their pre-flight checklist, and asked the stewardess to sit in the last remaining seat, next to fifty kilo sacks of rice and other commercial goods wedged around cargo netting that held passenger luggage at the back of the plane. 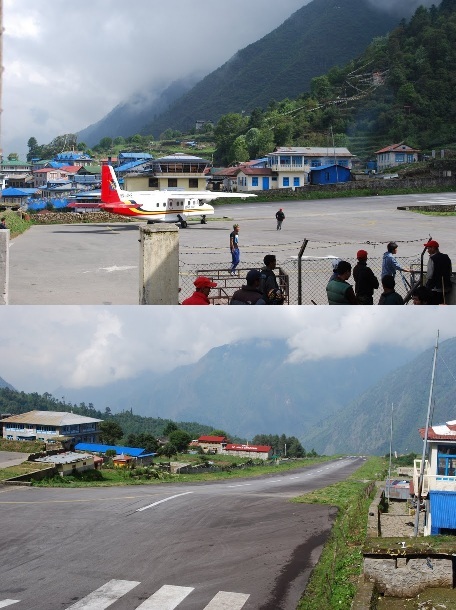 The propellers whirred to life, and the tiny aircraft taxied down the Tribhuvan Airport runway. 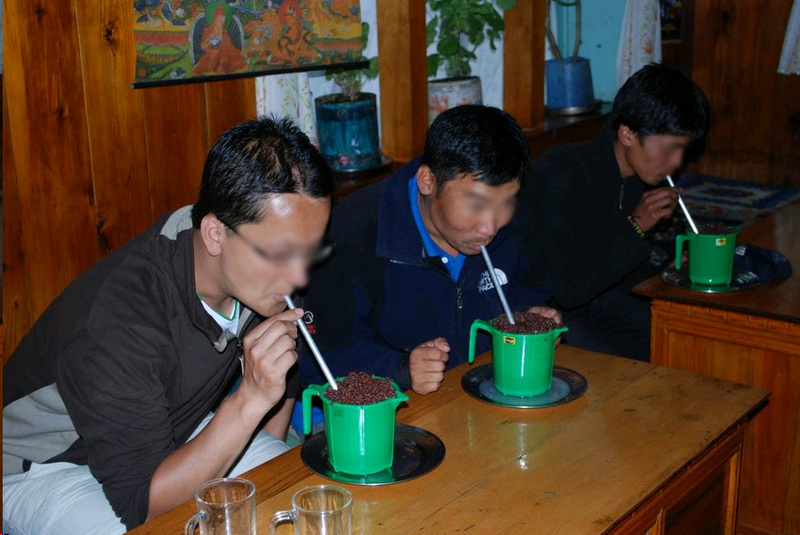 It was June of 2009 and I was traveling to the Solukhumbu region of Nepal with my husband P, and our school friend RH. Intent on hiking the most famous of Himalayan treks, our journey started with the thirty minute plane ride from Kathmandu to Lukla; a tiny airport-village perched on the side of a high mountain cliff, acting as the gateway to Shangri-La. 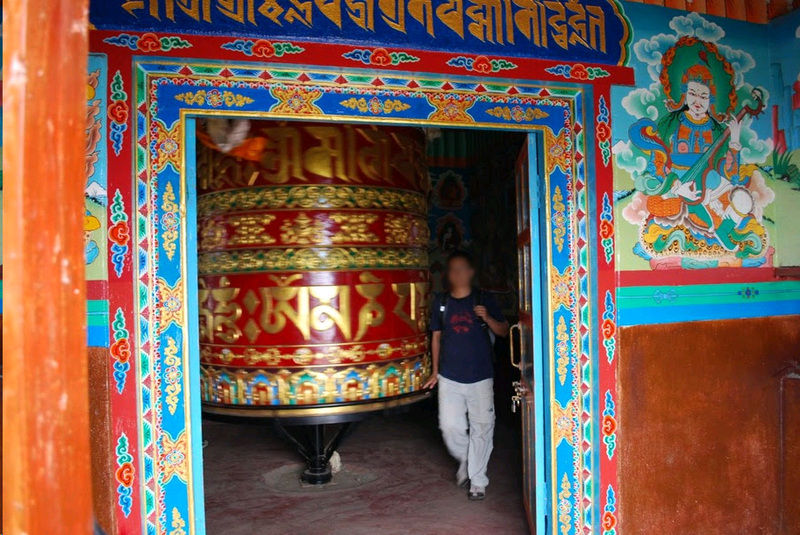 Lukla was both a beautiful destination, and a treacherous one. It consistently appears on lists of the “most dangerous airports in the world” as it is positioned amid slender, snaking, high altitude valleys, and is carved from a ledge 2,850 meters above sea level. On approach the runway, which is less than 460 meters long and 20 meters wide, looks more like a narrow parking lot than a place to land a plane. 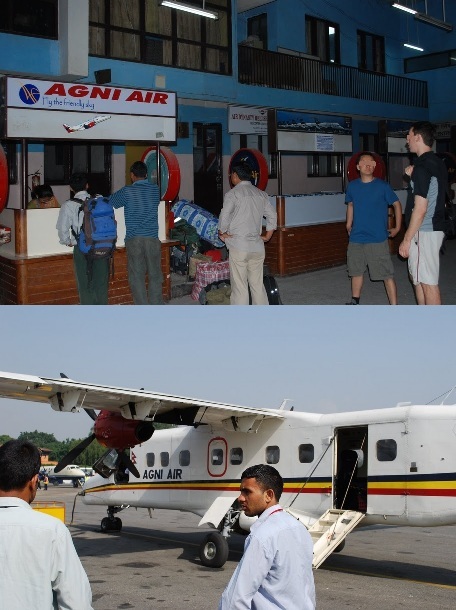 Our Agni flight departed the Kathmandu Valley and sped toward the wall of jagged snow-peaked teeth on the horizon. Fifteen minutes later we were gliding through a constricting green gorge shaped by the raging glacial river below. Mountain ridges were close enough to count individual treetops from the windows of the plane. The pilots were navigating by sight; in such a claustrophobic environment GPS units are not as trustworthy as a steady pair of eyes, and flights can only occur in good weather. Limited visibility meant grounded planes, or potential crashes. This route certainly has its share. Before our arrival, four flights had ended in disaster during the previous five years, including a 2008 Yeti Airline crash that killed eighteen. A German family captured the accident on video as they stood on the hill above the airport, camera trained on the edge of the runway. The plane’s engine hummed deeply on approach, but the valley was cloaked in a dense wall of cloud. The family waited for the Twin Otter to burst dramatically from the puffy whiteness and complete its journey safely to the tarmac. Burst it did—as a fireball—just below the edge of the runway. The German father muttered a shocked “Scheisse!” before dropping the camera. Chunks of white metal, rubber wheels, and other wreckage could be seen from both the ground and air for months. I tried to forget these images as the runway came into view. I reassured myself that it was Yeti Airlines that crashed, but I was flying Agni. I reasoned that the pilots had a vested interest in landing safely. I chided myself on seeking foolish adventures and putting myself at needless risk. I promised myself that I wouldn’t fly this route again. The approach was quick—from sky to earth with little change in altitude. The plane bounced hard on touchdown, and I gripped the back of RH’s seat, bracing for the aircraft to bank and flip, another gory headline for the news. Instead the wheels rolled to a hard stop before the pilot maneuvered the plane to the stone-built airport terminal. A deep sigh escaped my chest; I hadn’t realized I’d held my breath through the final moments of the flight. RH, P and I spent the next few days hiking in the beautiful mountain landscape, and at the end of our trek, we found ourselves inevitably back in Lukla. Unless willing to hike another five grueling days to the closest wheeled-transport, a flight from the tiny airport was the only way back to Kathmandu. The choice was clear; we boarded the same Agni flight—anxiety quickly forgotten in lieu of a successful adventure. Fourteen months later, in August of 2010, a news article caught my eye. The title mentioned a “tourist plane crash” in the foothills of the Himalayas. 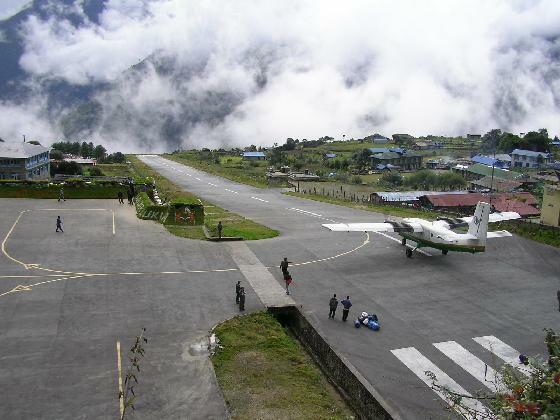 The flight departed from Tribhuvan Airport, intending to fly to Lukla, but turned back midway due to inclement weather. My heart sank when I saw the company—the Agni flight crashed before reaching Tribhuvan. All on board were killed including one Briton, one Japanese, four Americans, five Nepali and three Nepali crew. I searched Nepali news websites, eager for information. Unlike American news, which censors more graphic photography, I came across a series of grisly photos taken by the Nepali army and released to The Himalayan Times. The plane smashed into a rice paddy fifty miles outside of Kathmandu, and the muddy, water-filled crater was strewn with scraps of clothing and metal. A crowd gathered in the rain, hiding under umbrellas, watching the salvage work. The most haunting picture in the series was of two Nepali army troops wearing green fatigues, wiping their hands on a white cloth after loading light blue plastic bags of human remains into the back of a truck. There were five plastic bags in the picture, each no larger than a backpack. The garbage bags were translucent enough that one could tell the contents were fleshy, like the soldiers were carrying blue shopping bags of ground turkey meat. That meant the bodies had exploded on impact; there was nothing left but small pieces of each individual, mixed up in that mud pit and fished out by men treading barefoot through the water, looking for chunks of human. I had nightmares of small blue garbage bags filled with body parts, waiting on the curb outside my apartment, ready to be taken by early morning garbage men. It took time to connect the tail numbers. A follow-up article mentioned 9N-AHE. I searched through my album for the trek, and scrutinized each photo from Tribhuvan and Lukla: A photo of the white Dornier 228, with Agni’s black, yellow and red stripes along the side. Another with Rory and I sitting in our seats, toothy-smiles for Prajjwal the photographer, excited to fly to the tiny airport in the clouds. 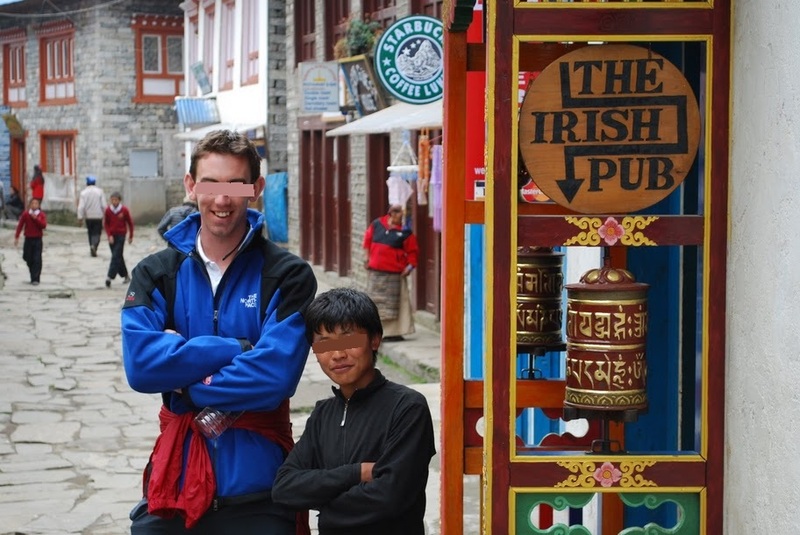 A third—Rory and I pose outside of the plane upon landing in Lukla, as porters carry luggage from the aircraft. A fourth, our plane taxis down the short runway, new passengers aboard, the tail number visible yet small. I zoom in on the picture; one click, then two, then three. I make out the characters: 9N-AHE. I re-read the articles—severe weather, spatial disorientation and loss of flight instruments, mechanical and pilot error, outdated crew checklists. The flight was doomed from the start. A flight I had travelled on. That picture of Rory and me in the dark blue fabric seats, smiling. Those seats are gone. Someone sitting in the same chair became chunks of flesh in a blue plastic bag in the back of a Nepali army truck. It made me physically ill. I thought of the beautiful stewardess wearing the red chupa, passing out foil-wrapped candies. I wondered again if her uniform apron meant that she was married. Did she leave behind a husband, perhaps a young child? I wish I could post the mini video directly on my site, but I don’t think I can. However there is a nice 30 second timelaps video of Kathmandu Valley/Nepal that gives some nice views of what the city and mountains look like. Check it out if you have the chance: http://nepal.tv/watch/nepal-trailer. 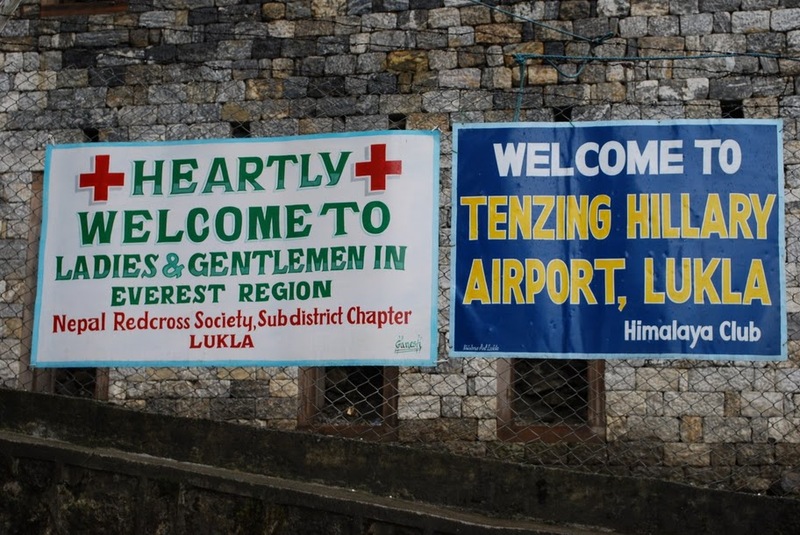 On the same site they have a few other videos, including a mini video about the take off/landing at Lukla Airport which those of you interested in an Everest trek might want to check out: http://nepal.tv/watch/lukla-airport. 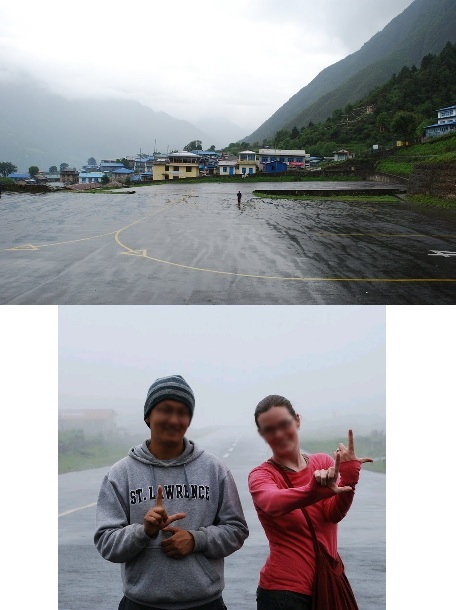 I’ve written about the tiny mountain airport of Lukla before, and how we got stranded in Lukla for a few days due to bad weather. 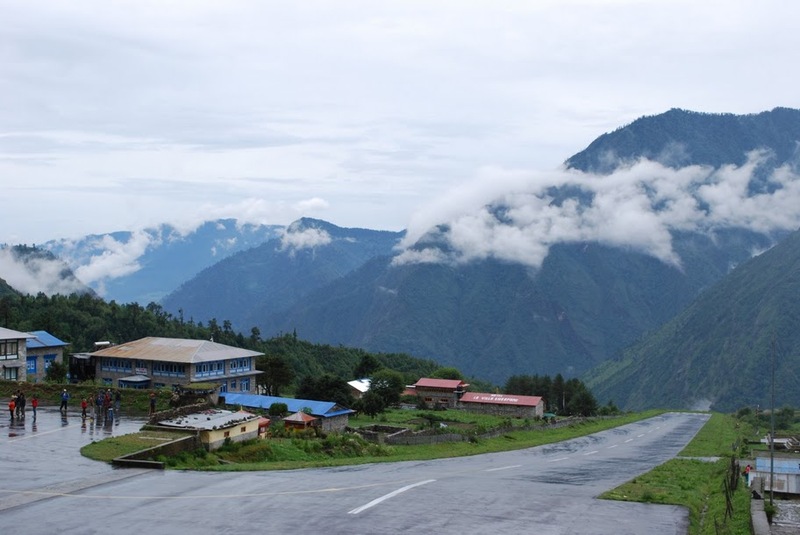 It’s supposedly one of the most dangerous airports in the world because of the altitude, angle and shortness of the runway, and the narrow valley leading up to the runway. Certainly there is a good reason for the flights not to travel when the weather is bad. Sadly an Agni flight traveling from Kathmandu to Lukla crashed Tuesday morning killing all 14 on board. 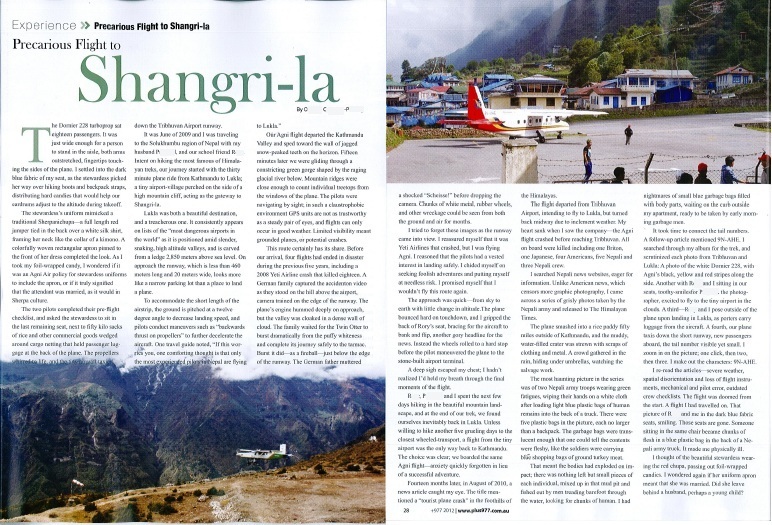 The flight took off from KTM, heading towards Lukla only to find that the weather was too bad to land and the flight turned around to return to KTM (something which also happened to us– but we were left in Lukla listening to the plane engines recede into the distance). Before the flight could make it back to the airport it crashed– about 50 miles from KTM– in a rural village. The photos are scary… the remains of the passengers– 4 Americans, 1 Briton, 1 Japanese, 5 Nepalis, and 3 Nepali crew– have been collected in small blue garbage bags, as if their bodies simply exploded on impact and left tiny pieces. It’s scary and sad, especially when I can picture exactly what the flight and the plane involved in the crash looked like, even the uniform of the flight hostess–a Sherpani styled chupa and apron.